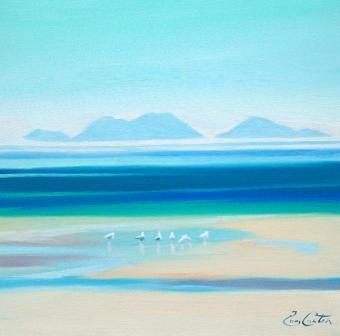 Right now we are waiting for new Pam CARTER Art to arrive at the gallery. In the meantime, here is a selection of the artist's archived art work which has featured at Red Rag Art Gallery. If you wish to register to receive updates and alerts when new art work from Pam CARTER arrives select this link. Pam Carter was born in Tanganyika, East Africa in 1952. Her mother was Austrian and her father Scottish. At the age of thirteen Pam came Scotland where she studied at Bearsden Academy.She graduated from Glasgow School of Art in the 1970's and then began a career in teaching. After teaching in Braidfield High School for four years Pam Carter took a year out to study at Moody Bible Institute in Chicago. Following that Pam spent a further two years teaching art in the Seychelles whilst on voluntary service with African Inland Mission. From the mid 1980's she has taught in various colleges, including Falkirk College. Whilst at Falkirk she was instrumental in developing the HND Public Art and helped write BA Design. In 2004 Pam decided to give up lecturing to concentrate on painting full time. 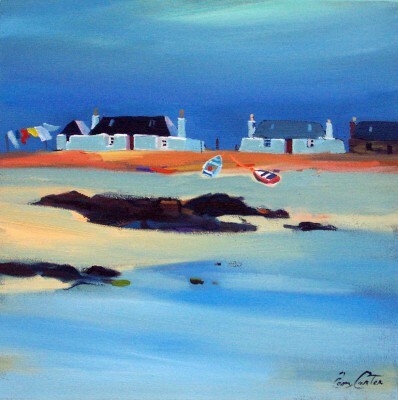 Today Pam Carter Pam has an international reputation for her strong, expressive paintings of the Scottish landscapes. She has had numerous solo art exhibitions throughout the UK and also in the USA. 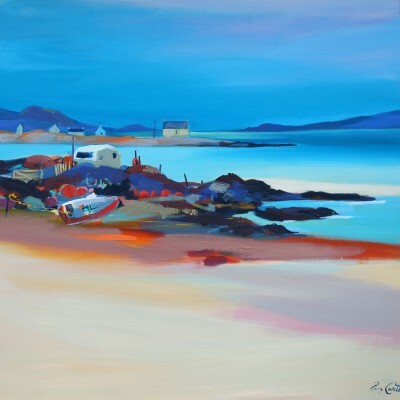 Her highly sought after oil paintings have been exhibited at several group art shows including the Royal Scottish Society (RSA), the Royal Glasgow Institute (RGI), Visual Arts Scotland (VAS), and the Paisley Art Institute (PAI). She is the recipient of many art awards including:the Royal College of Physicians and Surgeons Award at the Royal Glasgow Institute and a First Prize at the Paisley Institute. 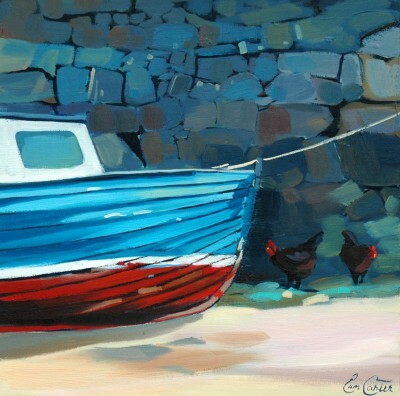 Pam's paintings have also been selected for the Laing Calendar. 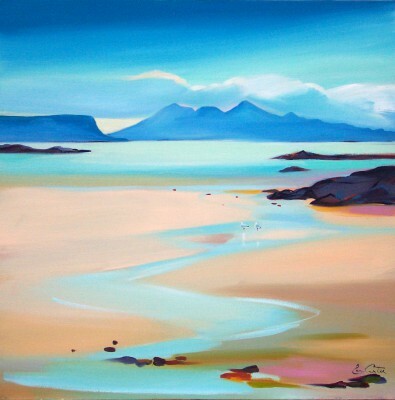 Pam Carter spends the summer in Skye and the Outer Isles from where she draws the inspiration for many of her colourful, atmospheric oils, which capture the remoteness and peacefulness of that unspoilt region of Scotland. This rugged West Scottish Coast provides the ideal subject matter with its isolated cottages and wild colours of the machair and brachen. 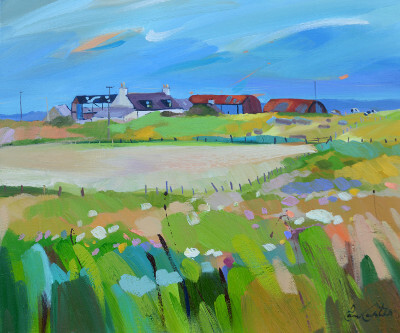 Pam is also drawn to the East Scottish Coastal area with its majestic cliffs, fishing villages and farm land. 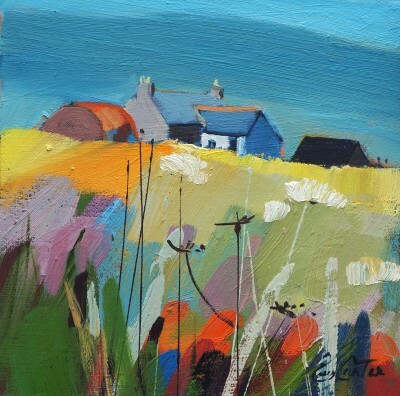 In creating her art work Pam Carter loves to stand on a high viewpoint in the landscape. 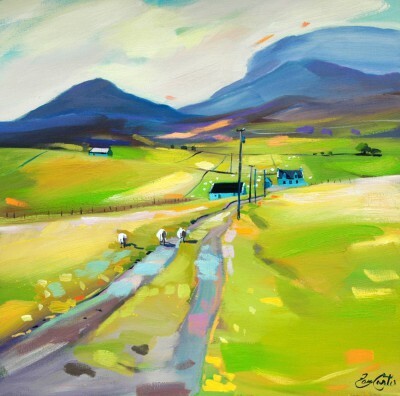 From there she observes and is inspired by the magnitude of the Scottish Landscape. She finds the sometimes challenging trips to the Western Scottish Isles brings great reward. Here she captures the magic of the landscape with its sweeping golden sands and turquoise tranquil waters which convey an almost tropical paradise. Scottish locations such as Skye, Lewis, Harris and the Uists have long been favourite places for Carter to visit. 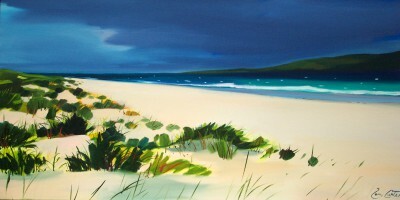 Pam has also undertaken many paintings of Tiree and Coll. Tiree in particular offers idyllic settings with its Island architecture reflecting like a museum of Scotland's past with wonderful cottages sitting perched on the most beautiful of beaches. In Pam Carter paintings a sense of the place is important. However Pam does not seek to capture a scene with complete accuracy. Sometimes it is the elements and the untamed force of nature that she finds inspiring, but importantly it is the essential quality of light which is present in the Scottish land and seascapes. In her painting Pam often interprets the scene with abstract elements. 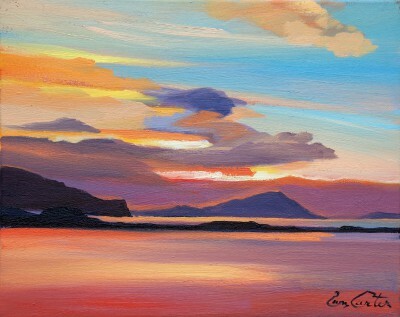 She also translates the light capturing contrast and colour. Colours are often bold but there is always a sense of subtlety and balance in the works. 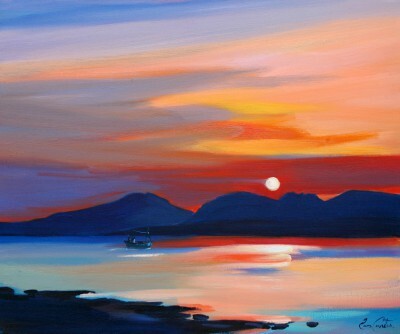 Pam's aim is to ultimately create a visual sensation and pleasing image in her oil paintings.